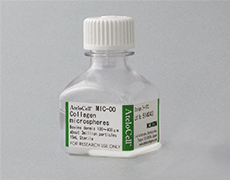 Efficacy of bone regeneration using collagen microspheres as scaffold. Shunsuke Baba, Naoyuki Matsumoto, Yuki Kaneshita, Kaoru lnami, Hidetoshi Morikuni and Takayoshi Kawazoe. J Osaka Dent Univ. 2008. 42(1), 9-15. Mandibular reconstruction using a combination graft of rhBMP-2 with bone marrow cells expanded in vitro. Seto I, Marukawa E, Asahina I.
Propagation of human nasal chondrocytes in microcarrier spinner culture. Shikani AH, Fink DJ, Sohrabi A, Phan P, Polotsky A, Hungerford DS, Frondoza CG. The role of osteopontin on calcium oxalate crystal formation. Konya E, Umekawa T, Iguchi M, Kurita T.
Collagen microcarrier spinner culture promotes osteoblast proliferation and synthesis of matrix proteins. Overstreet M, Sohrabi A, Polotsky A, Hungerford DS, Frondoza CG. The effect of osteopontin immobilized collagen granules in the seed crystal method. Umekawa T, Iguchi M, Kurita T.
Beta-1 integrin expression by human nasal chondrocytes in microcarrier spinner culture. Bouchet BY, Colón M, Polotsky A, Shikani AH, Hungerford DS, Frondoza CG. Human chondrocytes proliferate and produce matrix components in microcarrier suspension culture. Frondoza C, Sohrabi A, Hungerford D.
Comparative histological studies of bone and cartilage formations induced by various BMP-carrier composites. :Comparative histological studies of bone and cartilage formations induced by various BMP-carrier composites. 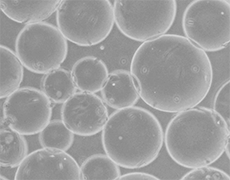 Cross-linked collagen gel spheres as a useful carrier for cell culture of MC 3T3-E1 clonal osteogenic cells. Morimichi Mizuno, Tomoyo Kasagi, Yoshinori Kuboki. Japanese J. Oral Biol. 1988 30(6):855-8. Type I collagen can function as a reservoir of basic fibroblast growth factor. Kanematsu A, Marui A, Yamamoto S, Ozeki M, Hirano Y, Yamamoto M, Ogawa O, Komeda M, Tabata Y. Expression of vascular endothelial growth factor promotes colonization, vascularization, and growth of transplanted hepatic t issues in the mouse. Ajioka I, Akaike T, Watanabe Y. Correlation between cell-adherent activity and surface structure in Porphyromonas gingivalis. Watanabe K, Yamaji Y, Umemoto T.